Quite possibly one of the most durable solar lanterns that we've come across, the silicone firefly lantern has a silicone bulb that makes it hardy to the elements and ideal for outdoor situations such as camping, festivals, garden lighting and more. 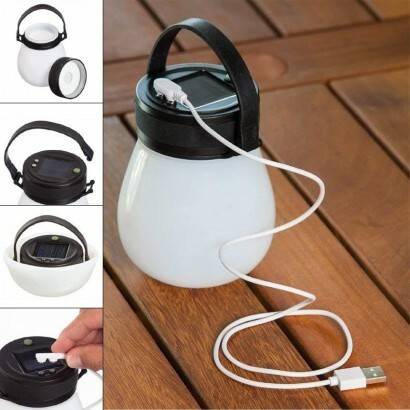 It's collapsible silicone body makes this versatile solar light easy to pack taking up minimal space, and should you need an extra boost, you can charge it by USB too! Lit by three bright white LEDs, this solar lantern has four light settings; low: 25 lumens, medium: 50 lumens, high: 100 lumens or flashing, making it ideal for all manner of situations from ambient tabletop garden lighting to campsite lighting, and even a flashing signal beacon!